Court House Quilters present two donations to the Fayette County Food Pantry. One donation represents $1 of each admission to their quilt show in May. Country Quilters of Hillsboro made a donation to the pantry to thank CHQ for their gift of quilt show racks and other show supplies. Left to right, CHQ member Beth Foster, pantry volunteers Joyellen Pickelheimer, Judy Fox, and Lee Reno, quilters Bobbie Long and Colleen Downing. 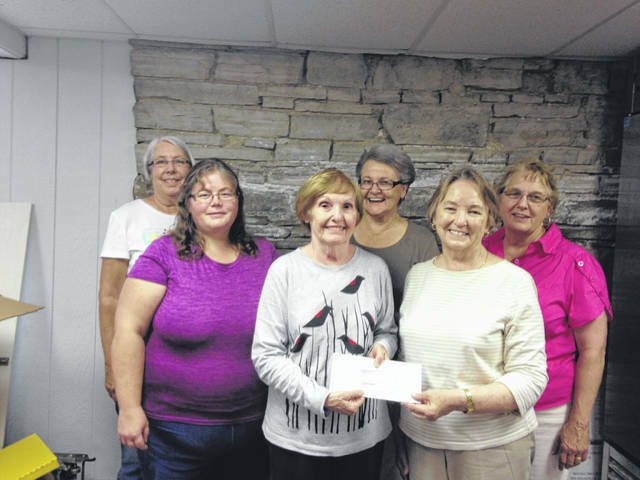 https://www.recordherald.com/wp-content/uploads/sites/27/2018/06/web1_Quilters1.jpgCourt House Quilters present two donations to the Fayette County Food Pantry. One donation represents $1 of each admission to their quilt show in May. Country Quilters of Hillsboro made a donation to the pantry to thank CHQ for their gift of quilt show racks and other show supplies. Left to right, CHQ member Beth Foster, pantry volunteers Joyellen Pickelheimer, Judy Fox, and Lee Reno, quilters Bobbie Long and Colleen Downing.